Have you ever been sending an email and wanted to sign off with a handwritten signature? Maybe it's an important email that requires a signature for disclosure, or perhaps you want to add a personal touch to your email. In the past when everything was pen and paper, there were no issues with signing a letter, but we're in the twenty-first century where everything is meant to be easier, yet somehow adding a handwritten signature isn't as simple as adding a bit of scribble...or is it? Using a scanner, insert the piece of paper and scan it, saving it as a .gif, .png or .jpg. Open your email client and insert your saved image. Using your email client's image tools, crop the scanned signature and scale it down to size. Using your mobile phone, open your camera app and take a photo of your handwritten signature. Send the photo from your phone to your email address. Once received, save the image to your computer then insert it into your email. Head over to Signature Maker. In the box, draw your signature using your mouse just like you would with a pen and paper. Click Save then Download Signature #1. An image of your handwritten signature will be saved to your Downloads folder. 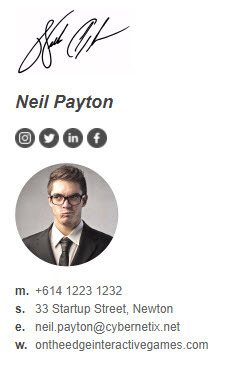 Insert the image into the end of your email to sign off! 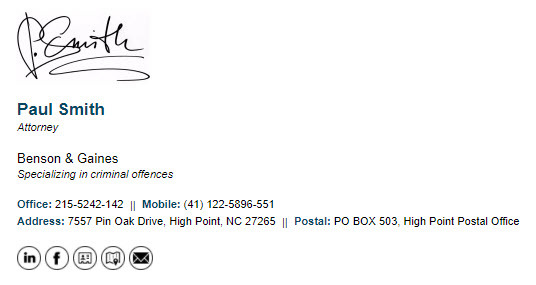 If you have a pen tablet handy, this is a great way to transfer your signature from pen to email. Open your drawing software such as Adobe Photoshop, Adobe Illustrator, Corel Draw etc. Using your pen and drawing tablet, write your email signature out onto the screen. Crop and save your signature as a .png, .gif or .jpg. 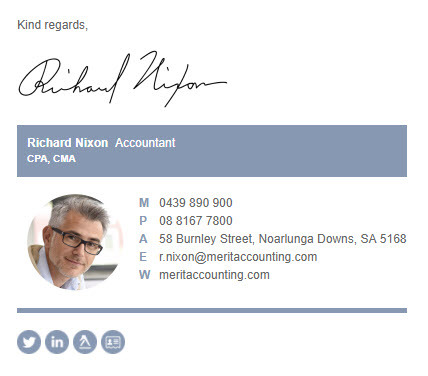 If you really want to come across as professional, it's best to add your handwritten signature into an email signature. 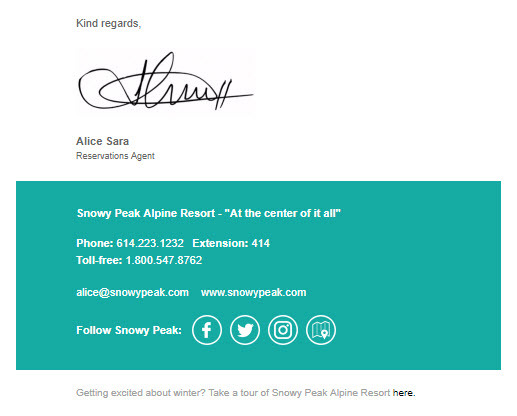 We've added some great examples for you below which have all been created by Email Signature Rescue users.